SAMANTHA Kerr has added another honour to her growing list after being selected in a women's world team of the year. The Matildas striker won the approval of from voters in 91 countries as the International Federation of Football History (IFFHS) announced its 2017 rankings in Zurich. Kerr had already claimed awards as the Australian Sports Woman of the Year, the ABC Sports Personality of the Year, the MVP of the USA National League, the Julie Dolan Medal for Australia's W-League and Asian Women's Footballer of the Year. She was the first Australian woman to be named as a contender for the FIFA Player of the Year, but failed to make the final three. 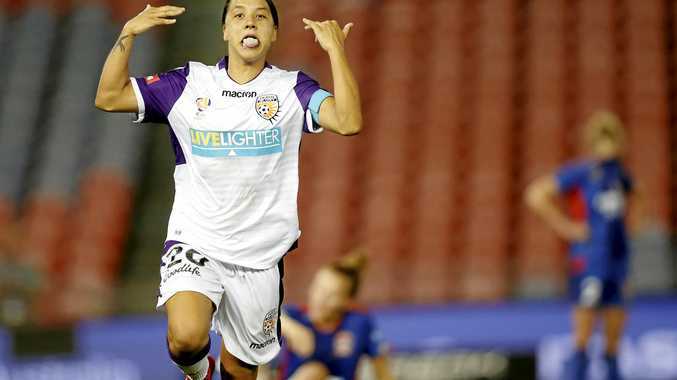 On Saturday, Kerr scored a hat-trick in seven second-half minutes for the Glory and celebrated the feat with her trademark back somersault. "I think I can still get better and have a lot of learning and growing up to do,” the 24-year-old Kerr said. The IFFHS also named the men's team of 2017 which was headed by Lionel Messi and Cristiano Ronaldo.